You may ask, how does this relate to real estate? Well, it really doesn't, but I found it interesting seeing that "A", I drive a car, and "B", I stopped into the Apple store twice this weekend and am considering a switch to the iPhone. 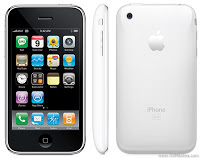 Apple came out and said they sold over 1 million new 3G S iPhones that began selling on Friday. The highest Wall Street estimates had them selling 750,000, so once again, Apple far exceeded expectations. As many of you have probably noticed at the pump, gas prices have been on tear the past couple months, as oil rose to over $72/barrel. Fortunately prices pulled back today and oil is trading around $67/barrel. The price of a gallon of gas was on a 54 day rally that finally ended. I've added a poll to the blog to see what phones my readers are using. Please go to the Terrier Blog site and take the survey.